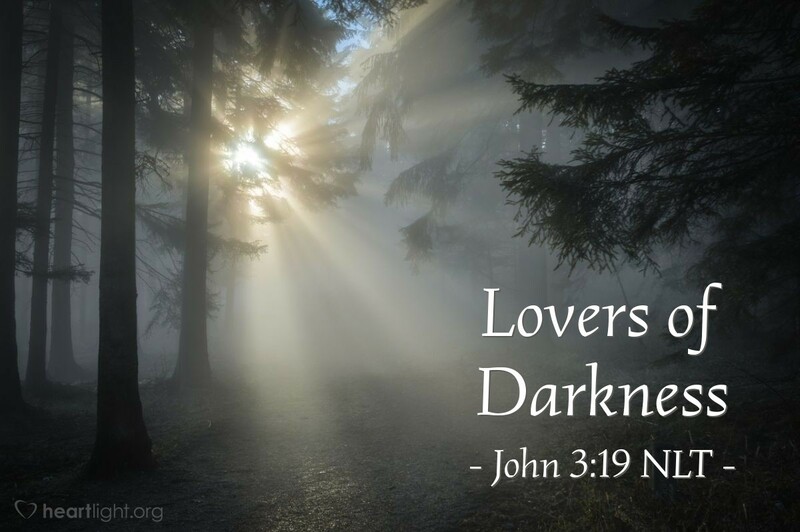 [Jesus said,] "And the judgment is based on this fact: God's light came into the world, but people loved the darkness more than the light, for their actions were evil." Some folks don't just reject Jesus; they hate God, Christianity, religion, Christians, and anything that smacks of wholesome living. Evil is real and controls the lives of those who give it safe harbor. Evil recoils from truth. Too often, some people end up rejecting the truth of God for a simple reason: They love how they are living and don't want to give it up. They are well on their way to being lovers of darkness. Don't let evil, or the Evil One, dull your spiritual senses so that you miss God's gracious and liberating truth. If you find yourself flirting with sin and evil, use the Joseph solution — get up and run away (Genesis 39:6-12)! When evil is allowed a place to grow, it will ultimately lead us to flee the light like cockroaches scurrying for cover when the light comes on. Let's keep our hearts set on Jesus and his righteousness. Holy and righteous Father, keep my heart tuned to your Son's grace, love, and righteousness. Increase my hunger and my thirst for your righteousness. Kindle my desire to seek first your Kingdom and your righteousness. Give me a holy passion to live in your light. In Jesus' holy and mighty name, I pray. Amen.